Pumpkin danishes and pumpkin cheesecake - YASSSSSSS!!! It's going to be a good week - what are y'all having to eat this week? These bon bons could not be any more perfect if they tried: chocolate, red wine, and espresso?! Yes, please! I wish I had a better picture of these bon bons because they were so darn delicious, but alas, they were so darn delicious and they did not last long. These were made in conjunction with my mom-in-law's birthday cake last December that was a chocolate cake with red wine chocolate buttercream. I actually put a few on the top of the cake for decoration. I used a red wine that we lovingly referred to as our "fertility wine" -- Nick and I drank it one night and ended up with Mason 40 weeks later. Turns out that our fertility wine also worked its wonders on my sister-in-law and her husband too because 40 weeks after her husband devoured the bon bons they brought home with them, they ended up with little Miss Presley, my first niece. I jokingly warn them that I will make more food with fertility wine (which is unfortunately all gone now) so I can have more nieces and nephews. These bon bons are a labor of love, but they are so good. Next time I make them (bwahahaha), I do want to try and make them a bit smaller because it's hard not to eat a whole one because they are so good, but they are also very rich. And don't miss out on the other chocolate recipes from #Choctoberfest bloggers today (scroll down to the bottom of the post to see them!) - it's only day 3, so there is tons of chocolatey goodness to come! I am so excited to take part in Choctoberfest this year. A huge thank you goes out to Allison of The PinterTest Kitchen for organizing the event - you rock, Allison. I love love love chocolate. LOVE. I have a few chocolate recipes to share over the next two weeks and I decided to start with a bang. This Hot Cocoa Poke Cake is the perfect recipe for me to share first. It's unbelievable. It's easily the best poke cake I've ever had. It consists of double fudge chocolate cake with hot chocolate mix in the batter. It's topped with hot fudge sauce and cocoa whipped cream then drizzled with more hot fudge. It's rich and oh so chocolatey. Be sure to check out the rest of the chocolatey recipes for today at the bottom of the post! I have my fingers crossed that I can find some banana peppers in our produce section. I may sub them out for another mild pepper or even pickled banana peppers. We are having a super pumpkiny weekend - WOO! :) My favorite! And we're having an old favorite on Tuesday that I am excited to try doing the way Taco Bell makes them with a little more accuracy. There was no hesitation for me to request a copy of this cookbook on Netgalley. I was so happy when it was gifted my way. I love one pot/one dish/one skillet meals. Basically, any meal that is going to mean less dishes for me is going to be high up on my favorites list! I picked out 5 recipes to make from the book to incorporate in my already planned out monthly meal plan. I decided upon Beef Stew, Ham & Potato Gratin, Chicken Tetrazzini, Minestrone alla Genovese, and Sausage and Kale with Garlic Roasted Potatoes. There were a million other recipes I wanted to try, but these were the ones that really spoke to me. I love the format of this cookbook. It's super colorful and easy to read. What I really love is that the ingredients list is on the right and the directions are on the left. I never really realized that that was a format that was easier for me to read, but it is! I got around to making all but the Ham & Potato Gratin (which I am so bummed about because it had gruyere in it!) Somehow the pictures of the Beef Stew did not make it, but I do have pictures of the other three recipes that were all keepers. The Beef Stew had the option for turnips or rutabagas which we have never tried, so we did turnips. I'm not sure how I felt about them, but the kids didn't seem to mind at all. It was still a fantastic, traditional-style beef stew. The Chicken Tetrazzini was the first recipe up and I chose it because I have my mom-in-law's recipe and I literally butcher hers every single time. So I am basically on a quest to find something that even comes close to hers and this definitely was it. I really loved the addition of green beans in it. It will definitely be one we will make again. And last, the Minestrone alla Genovese which is Genoa's version of minestrone - what makes it stand apart? You add pesto at the very end! Another win for all of us. Plus it had kale, pasta, and more beans. I made a lot of kale and bean recipes! 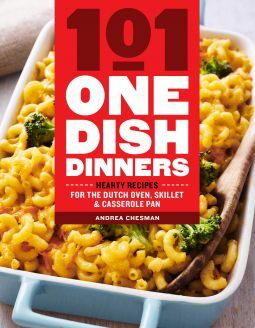 101 One-Dish Dinners gets 4 Utensils from me! There is a great variety of recipes and they are all relatively easy to make and there is little clean up afterwards!